Opening weekend $6.857 million on 1912 screens. Rated PG-13 for intense battle sequences, disturbing images, violence and some sensuality. Maybe someday young actor Heath Ledger will develop into a strong box office attraction, but it hasn’t occurred just yet. To be sure, he has his fanbase; God knows I’ve gotten enough nasty letters in regard to 10 Things I Hate About You to convince me of that. But Ledger has yet to play the lead in a hit. Granted, he’s only enjoyed limited opportunities in that regard. 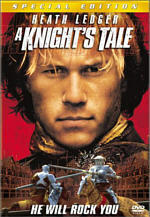 Ledger’s big shot at a lead came with 2001’s A Knight’s Tale, which made a modest $56 million and fell short of expectations that it might become a summer blockbuster that year. 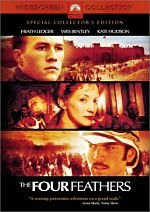 Ledger stars in 2002’s The Four Feathers, but that flick didn’t exactly turn him into box office gold. In fact, although the period drama enjoyed some positive pre-release notices, it died a quick death at multiplexes. Feathers took in a mere $18 million in the US, a figure far below its $80 million budget. Did the flick deserve such a fate? No, it definitely offered a more compelling experience than its poor gross might indicate. However, the movie didn’t seem like anything exceptional as a whole, although it certainly had some stellar moments. Set in 1884, a text introduction relates the concept of the white feather of cowardice. If a subject doesn’t want to serve in the British military, they receive a white feather as condemnation of their spinelessness. After this, we meet Harry (Ledger) and Jack (Wes Bentley), members of the British army regiment called the Royal Cumbrians. We first encounter them at a military ball where we learn that Harry plans to marry Ethne (Kate Hudson). Jack clearly feels jealous of this relationship, but he keeps it quiet in Victorian fashion. All seems well in Harry’s world until he and the others learn of a revolt in the Sudan. The Royal Cumbrians will be sent to stem it, and almost all of the soldiers feel excited to go. However, Harry seems less than exhilarated, and he questions the need for the mission. Harry soon realizes that he really doesn’t want to go, so he resigns his commission rather than head to war. Harry then deals with the universally negative reaction from his friends and peers, and he gets four white feathers of cowardice. Most painfully, one of those comes from Ethne. We see Jack at war, where he does well personally. Tortured by his decision, Harry eventually decides that he needs to go to the Sudan and catch up with the Cumbrians; he doesn’t know what he’ll do there but he feels the need to meet with them. Eventually he “goes native” and gets enlisted for work detail for the soldiers. He hooks up with local Abou (Djimon Hounsou) as his guide; he tries to infiltrate the path of the Mahdi – the leader of the foes opposed to the British - and help his friends. The rest of the flick follows Harry’s personal journey toward redemption. On the positive side, Feathers provides an unusual case for a lead. It’s rare to see someone take on a character who could be perceived so strongly as a coward, and I respect Ledger for going out on a limb. Unfortunately, the movie so quickly ensures that we know he possesses great internal fortitude that we don’t see much of this side. We get a quick look at Harry’s fears but the film doesn’t spend much time with that issue. He becomes branded a coward and cast out by his friends and rapidly decides to find some way to redeem himself. Feathers might have seemed more interesting if it furthered explored the societal reactions to Harry’s apparent cowardice and the way he dealt with those issues. The first half of Feathers doesn’t go much of anywhere, but it improves significantly during its second hour. That occurs largely because of the presence of a terrific battle sequence midway through the movie. Director Shekhar Kapur stages this fight in a dramatic manner that really makes it stand out from the crowd. It doesn’t feel like a modern war inserted into older times; instead, it keeps the flavor of the era and seems stunning. The movie maintains a lot of that energy even after the battle ends. Nothing in the rest of the flick can quite compare with it, but at least the flick never returns to the mild torpor that mars the somewhat slow-moving first half. After the fight scene, the film feels like it has more of a sense of purpose, and it becomes significantly more compelling. The Four Feathers remains a movie with some flaws. Hudson gets little to do, and none of the characters receive terribly strong development. Even Harry remains somewhat two-dimensional. Nonetheless, even with a moderately flat first half, Feathers works well enough to merit a look. 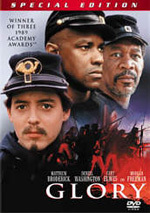 The Four Feathers appears in an aspect ratio of approximately 2.35:1 on this single-sided, double-layered DVD; the image has been enhanced for 16X9 televisions. The picture presented a good piece of work as a whole. Sharpness seemed fine for the most part. Some wide shots came across as a little soft at times, but those occasions occurred infrequently. Instead, the majority of the movie looked crisp and well defined. I discerned no issues related to jagged edges or moiré effects, but a little light edge enhancement showed up a few times. Other than some stylized grain, the film seemed free of flaws. I noticed no examples of grit, specks, or other concerns. A film with a low-key and somewhat gloomy palette for the most part, Feathers included few bright colors. Nonetheless, the DVD seemed to replicate the tones appropriately. Reds stood out, and occasionally other tones came across as reasonably bright and distinct, but generally the colors were desaturated to fit the mood of the movie. Black levels seemed deep and rich, but shadow detail appeared a little murky at times. Low-light sequences generally looked fine, but some of them were a bit darker than I’d like, such as the scene in which Harry told Ethne he left the army. Overall, the image of The Four Feathers looked positive. The Dolby Digital 5.1 soundtrack of The Four Feathers also seemed solid but it fell short of greatness. The movie maintained a forward emphasis that picked up during action scenes. For the most part, the film showed good stereo imaging to the music and created a nice sense of atmosphere across the front channels. Material blended together neatly and seemed well integrated. As I mentioned, surround usage came across as subdued except for the film’s occasionally fight sequences. Those used the rear speakers effectively though not exceptionally. They added a good sense of life to the movie, though, and they appeared appropriately active at those times. Audio quality appeared fine. Speech seemed natural and distinct, and I noticed no issues related to intelligibility or edginess. Music sounded bright and concise and displayed solid dynamics. Effects also came across as accurate and bold, and they showed positive bass response. Low-end material seemed tight and rich and lacked any issues related to boominess or distortion. Overall, the scope of The Four Feathers didn’t appear broad enough to merit “A”-level consideration, but it worked well enough to earn a “B+”. Despite the film’s disappointing box office reception, Paramount grant The Four Feathers a fairly positive treatment on DVD. 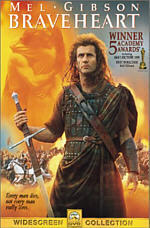 Its supplements start with an audio commentary from director Shekhar Kapur, who offers a running, screen-specific piece. Though the track sags at times, Kapur mostly provides a nice examination of the film. He often concentrates on character insight and historical issues, as he attempts to elaborate on the era in which Feathers takes place. However, the director also broadens into other topics such as sets, locations, and working with the actors. Technical and storytelling elements become more prominent during the second half of the flick. The occasional empty space mars the presentation, but generally Kapur gives us a useful discussion about his film. After this we find a program called A Journey From Within – The Making of The Four Feathers. The 16-minute and six-second documentary features the standard combination of movie clips, shots from the set, and interviews; we hear from screenwriter Michael Schiffer, director Kapur, executive producer Marty Katz, and actor Heath Ledger. However, despite the traditional format, “Journey” seems substantially more introspective than most pieces of this sort. We get information about the movie’s origins, how it varies from the early 20th century book on which it was based, character issues and various thoughts about different worldviews. The show doesn’t relate a lot about the actual making of the film, but it provides a thoughtful and interesting discussion of the topics that affected the flick. Next we get a collection of seven featurettes. These run between two minutes, 30 seconds (“The Friendship of Abou Fatma”) and 17 minutes (“A Historical Perspective”) for a total of 38 minutes, 12 seconds of footage. These follow the same model as “A Journey From Within”, and director Kapur dominates them. For most, he’s the only interview subject, and he appears in six of the seven featurettes; only “A Historical Perspective” lacks his input. In that piece, we heat from US Naval War College Professor Rick Norton, Huntington Library Victorian Art Historian Anne Malleck, Huntington Library 19th Century Art Historian Diane Waggoner, armorer Richard Hooper, and military coordinator Henry Camilleri. In addition, screenwriter Schiffer and actor Ledger show up in a couple of the other featurettes. Despite the revolving roster of commentators, the seven programs all match up with “A Journey From Within”, as they come from similar origins and use the same tone. We learn about various topics such as the eastern vs. the western motifs in the score, the historical facts and backdrop behind the story, Kapur’s lone trek into the desert, and much more. Again, the pieces remain surprisingly introspective. They lack the promotional bombast of many featurettes and dig nicely into the subjects and issues. While I’d prefer one comprehensive documentary to this collection of short pieces, the various featurettes nonetheless smoothly relate a lot of interesting material. Finally, the DVD ends with a pair of trailers. We get the theatrical ad for The Four Feathers - presented non-anamorphic 1.85:1 with both Dolby Digital 5.1 and Dolby Surround 2.0 audio – as well as a promo for The Core. Shown non-anamorphic 1.85:1 with 2.0 sound, the latter also shows up when you start the DVD. Note that except for the trailers, all of this platter’s video-based supplements provide both English and French subtitles. While The Four Feathers didn’t seem as stimulating as director Shekhar Kapur’s prior flick – 1998’s lively Elizabeth - it offers a generally solid experience. The movie suffers from some parts that drag, but it redeems itself in time. The DVD provides pretty positive picture and sound along with a nicely introspective and illuminating set of extras. The Four Feathers didn’t bowl me over, but I recommend it nonetheless.